Acadia National Park is located along the rocky coastline of Maine, occupying most of the 108-square mile island of Mount Desert Island and several neighboring smaller islands in the Atlantic Ocean. Originally federally sanctioned as Sieur de Monts National Monument in 1916, it became Lafayette National Park in 1919 and ten years later, the park's name was changed to Acadia National Park in honor of the New France colony of the 17th and 18th centuries. 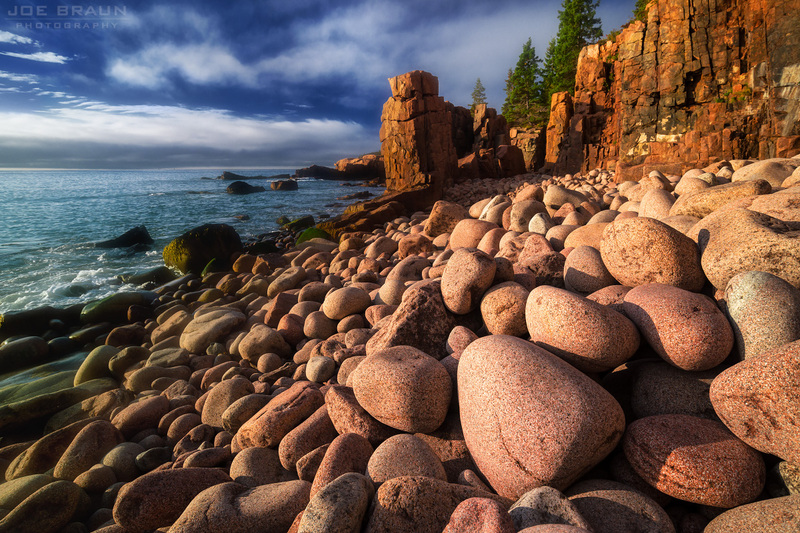 Acadia National Park is the oldest national park east of the Mississippi River and is also one of the most popular with over two million visitors a year. Mount Desert Island's appeal is the combination of majestic rounded mountain vistas with the nearby ocean and the beautiful forested valleys, streams, and lakes in between. The island is composed mostly of course pink granite formed from magma that bubbled to the surface roughly 400 million years ago and created a huge east-west highland. Over the last two to three million years, several waves of glaciers repeatedly carved through the granite, creating a large network of north-south ridgelines and valleys. As the last glacier receded roughly 14,000 years ago, it plugged up the valleys creating many beautiful fjord-like lakes in between the peaks. The ocean continues the transformation process by constantly chipping away at the coastline and tumbling large granite rocks, turning many coves into beautiful cobblestone beaches. Acadia National Park has a vast network of roads, hiking trails and carriage roads (discussed in more depth on the Hiking page) that allows visitors to easily explore the diverse scenery. Unlike many larger and more remote national parks that require long, strenuous hikes and/or backpacking routes to see some of the best scenery, all of Acadia's treasures are fairly easily accessible. During a vacation day in Acadia National Park, you can typically squeeze in several moderate day hikes and then spend the evening enjoying a gourmet seafood meal in the tourist town of Bar Harbor or in one of the other towns on Mount Desert Island. 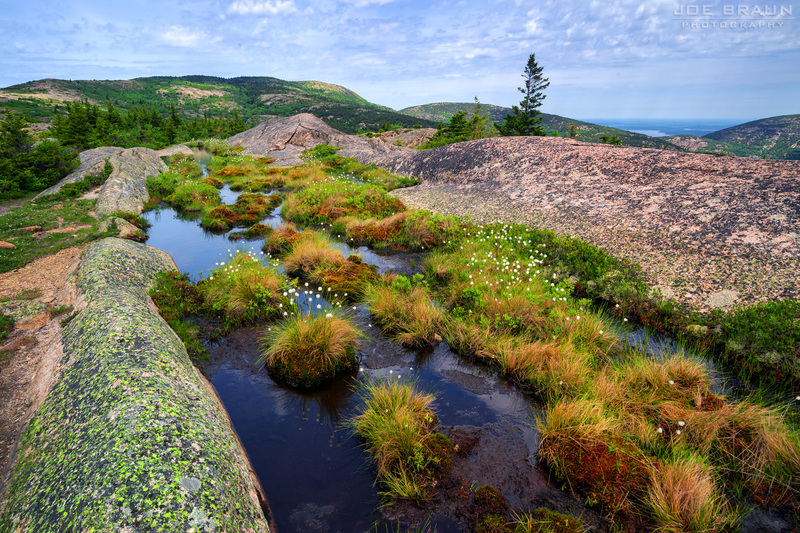 Drive the Park Loop Road to see the rugged Acadia coastline. Be sure to park at Sand Beach, Thunder Hole, or one of the other parking spots and take a leisurely hike along Ocean Path to explore the beautiful granite formations by the ocean. 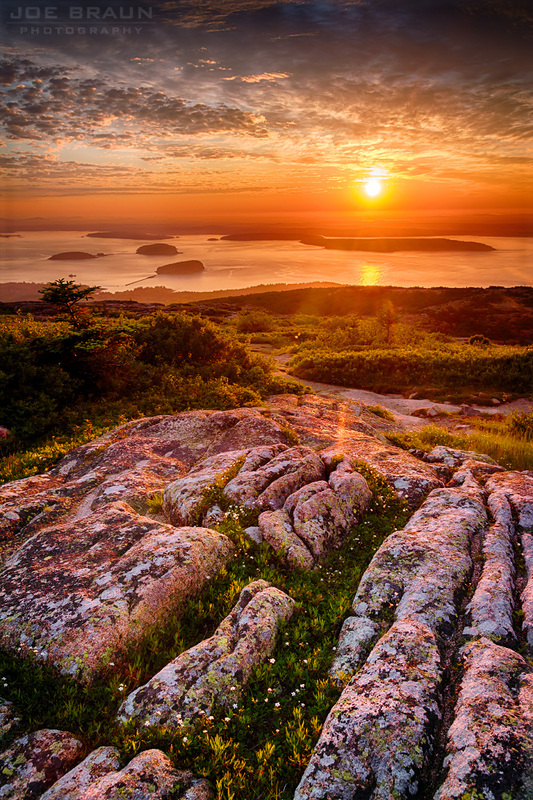 Catch sunrise from the top of Cadillac Mountain. Cadillac Mountain is the highest peak on Mount Desert Island and is one of the first spots in the United States to catch the morning sun. Waking up very early for a pre-dawn drive to the summit to take in first direct sunlight is an Acadia classic! Hike to the top of one of Acadia's peaks. While Acadia's highest peaks are less than 1600' above sea level, the views from the summits are still exceptional. Consider an easy peak hike like the South Bubble (and the famous Bubble Rock), or something a bit more strenuous like Acadia Mountain, Pemetic Mountain, or the many other peaks. With over 120 miles of hiking trails, the hiking options are plentiful. Enjoy a family-friendly hike to one of Acadia's other coastal areas, such as Wonderland Trail, Ship Harbor Trail, or Hunters Beach Trail. Take a bike ride along the beautiful carriage roads! Acadia has over 45 miles of well-groomed carriage roads open to hikers, bikers, and even old-time horse-drawn carriages. A bike ride along the immaculate roads through the forested mountainsides and along the ponds is an incredible experience. Bicycle rentals are available in Bar Harbor. Hike or bike to see one of the historic Rockefeller carriage-road bridges! Scattered throughout the carriage-road system are some beautiful works of art, including Cobblestone Bridge, Duck Brook Bridge, Waterfall Bridge, Amphitheater Bridge, and more! Have a meal at the Jordan Pond House. The Jordan Pond House is one of the top-rated restaurants in any national park and has a long tradition of serving tea, popovers, lunch, and dinner with a beautiful view of Jordan Pond and the Bubbles in the distance. Reservations recommended! Enjoy fresh lobster, clam chowder, and blueberry pie at one of the roadside lobster pounds or resturants around the island. The Acadia experience isn't just about hiking in the wilderness; it's also about enjoying the abundance of fresh seafood. See one of Maine's most iconic lighthouses: the Bass Harbor Head Light. Hike one of Acadia's legendary "iron rung" routes. Hikes like the Beehive Trail, the Precipice Trail, and the Jordan Cliffs Trail are thrilling experiences, but these exposed routes are not recommended for those with a fear of heights or for those who aren't steady on their feet. Go on a commercial boat ride for whale watching, lobster tours, fishing trips, lighthouse sightseeing, etc. Complete list on the Bar Harbor Chamber of Commerce site. Diver Ed's Dive-In Theater is a personal favorite. Go swimming at either of the two official beaches that have lifeguards: Sand Beach (cold ocean swimming along the Park Loop Road) and Echo Lake Beach (warmer fresh-water swimming in one of Mount Desert Island's glacial-carved lakes). Many of the other ponds and lakes are public water supplies, so please obey any posted "no swimming" signs. Go rock climbing. Many spots in Acadia National Park are popular spots with climbers, including the SE face of South Bubble Mountain, Otter Cliffs, Great Head, the South Wall of Champlain Mountain, and the south ridge of Beech Mountain. 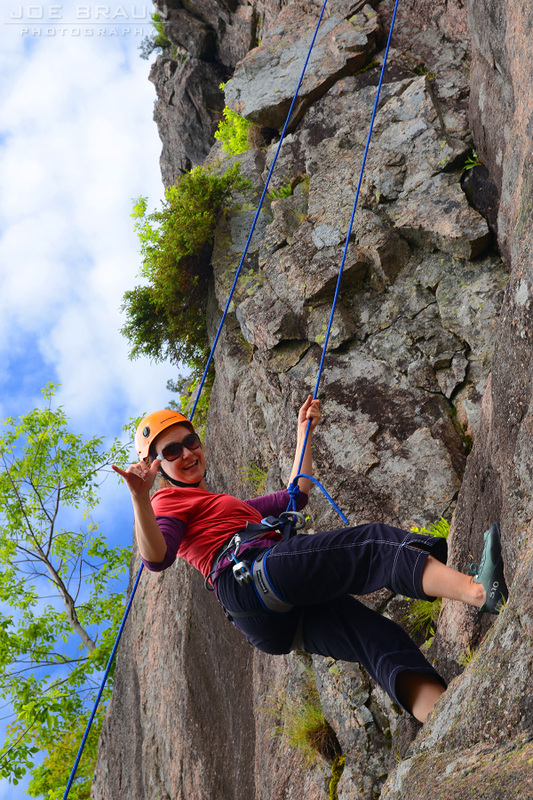 Outfitters in Bar Harbor, including Acadia Mountain Guides and Atlantic Climbing School offer guided tours and courses. Relax in Bar Harbor. If you need a break from exploring and adventuring, the tourist town of Bar Harbor is a great place to relax, go shopping, and find a good restaurant.